The RingCentral iPhone app is free to download from the iTunes App Store for customers with a RingCentral account. This app comes with many advantages, including the ability to make VoIP calls without using minutes from your wireless plan, and to make and receive calls using your company’s business number. You are also able to show your RingCentral number as your caller ID and keep all of your business voicemails separate from your personal voicemails. With the RingCentral app, you can receive, view, and forward faxes, as well as receive push notifications for incoming messages. Additionally, you can view your RingCentral call logs and access all your company extensions as a contact group. The app is also available for the Android and the Blackberry. Click here to read our full review of RingCentral’s business VoIP system. Phone.com offers a free app for iPhone users who have an existing Phone.com account. 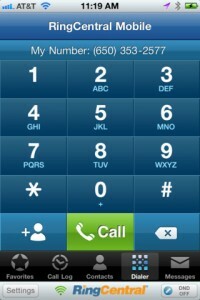 Phone.com’s iPhone app comes with many great features, including the ability to listen to and manage voicemails, view received faxes, view your extension’s call logs, block calls from unidentified users, and make calls from your virtual office phone number. With this app, you can also send and receive text messages from your virtual office phone number and quickly connect to your conference bridge. The only downside is that the iPhone version is only available as a Web App. The app is available in native versions for Android and Blackberry. Click here to read our full review of Phone.com’s business VoIP system. 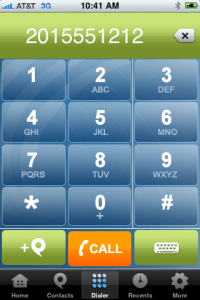 Other business VoIP services that offer an iPhone app include Vonage and 8×8. For more information on business VoIP systems, visit our Business VoIP Comparison. Microsoft has to introduce Office for Tablets before any other does.